My goal this morning was to sit down at my desk/computer, wade through the piles and eventually, share some boden-love. But when I walked over to my desk with a very hot, very full cup of coffee in hand, I realized there wasn’t even a flat surface to set it down on. But I’ve made some progress–I moved several of the piles on to my bed–so now there’s room. 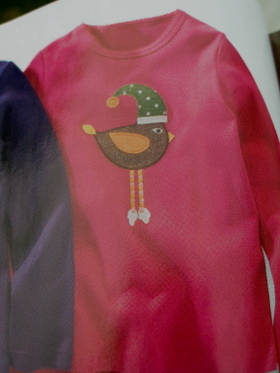 And Boden also has a new baby section, too. I can’t take it. And on a totally different note–for the record, can I just say that my 3 year-old is a total ‘card’–as my grandmother said yesterday. Each morning when Elizabeth wakes up from her nap, Mary goes in, flips on the light and climbs into Elizabeth’s crib to play with her. It’s become sort of a routine around here and she really anticipates those first coos coming through the monitor. But this morning, she came out Elizabeth’s room in this get-up–the pants that Elizabeth was wearing. Really, it’s never dull around here. that’s hilarious and awesome and i agree with you on all counts about mini boden and that mary is just making me laugh until i cry. oh so funny! i love when they want to wear something so badly that they don’t care how it looks or if it’s too tight. and i am right there with you on boden. just got our new catalog. jane might actually wear some of it! Man oh man, good stuff all the way around! I am a witness to this! Not the pants wearing but the climbing into the crib with wee Elizabeth. So darn cute. How in the world did she come up with – Now I will put the baby’s pants on. That’s so sweet! I hope my daughter is does the same thing when my son is born. BTW, I am a mini-boden fan, too. And what with the free shipping and returns, it’s just like buying local. 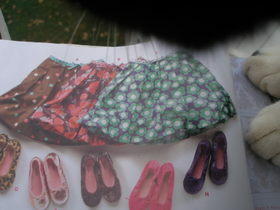 The green upside down hearts shirt and skirt that your daughter was wearing in the prior post, are those mini-boden finds? Very cute! Nice pants Mary!! Good to see she is getting into the ‘borrowing your sister’s clothes’ mojo so soon. 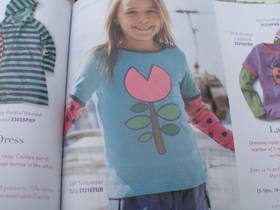 I’ll have to check out mini-Boden – looks lovely. Too funny with the pants! I just discovered the 13-14Y size fits (not that I’m running around in ice cream applique, but some of those smock tops are just cute enough!). Birthday money and some sale tops = Boden on a budget! I have a five year old who has a penchant for the same with her younger sister. LOVE the appliques. 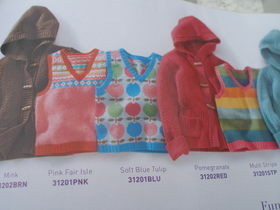 I do the same thing with the catalogs, not just the Boden ones, either. Except I can now rip out the pages I like, and stick them in a folder. Well, really, they’re just in a pile next to the computer, but at least it’s a little thinner and easier to ignore than a huge stack o’ magazines! Such a great pic of Mary in Elizabeth’s pants! It’s a good thing Elizabeth is such a chunker. 🙂 Ryan and I had a good laugh at the pic. I’ve been loving staying up on your blog. Saw you on babycenter too. So cool! We had a similar problem last winter (http://www.flickr.com/photos/urchinkids/381867959/). 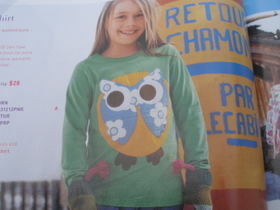 You’ve just got to do that owl applique! that is absolutely hilarious that Mary did that! what a great way to wake up, with your sis! I get a couple other catalogs too, you may have seen them, but if not you should check them out! Chasing Fireflies and Garnet Hill, they have that boden feel sometimes.